Every little girl wants to be treated like a fairy princess. This sweet and lovely design makes it possible! Perfect for a girl’s bedroom, the light yellow, pastel pink and creamy white colors are delicate and graceful. Three stairs lead up to the cushioned, high-rise twin bed which is supported by sturdy shelving and multiple drawers. The stairs also serve as mini drawers for added storage space. A pink, quilted blanket makes the bed with plush, accent pillows in colorful patterns placed atop it. Contemporary lamps are placed on both sides of the bed, resembling lit candles. 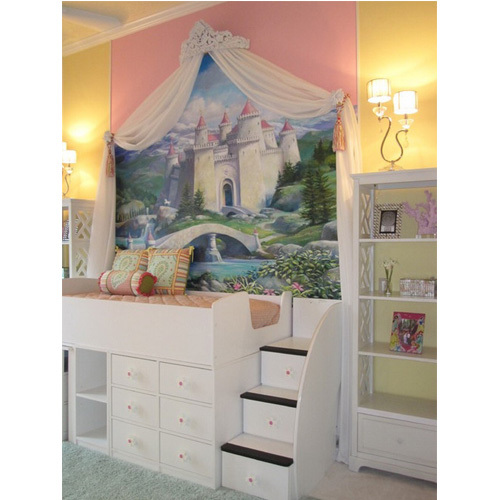 The silky white drapes frame the finishing touch of the design which is of a beautiful mural of far-away lands with a large castle overlooking a crystal blue lake. I adore this idea – reminding every girl she is magical and miraculous!